This delightful children's story can be enjoyed by kids and adults alike! 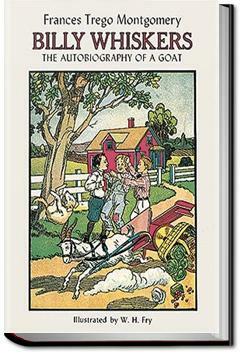 A mischievous goat, Billy Whiskers, gets into trouble so often that the book could be named, "Billy Trouble Whiskers"! This humorous story will bring you many chuckles and give you a chance to get lost in Billy's adventures with childlike enthusiasm. From riding in a police car, to being a firehouse mascot, getting married, and finding himself a circus goat, Billy's adventures will certainly keep you entertained! . . .I'll raise my bid to two dollars cash." "Not on your life will I sell him for that," said Tim. "Then how does three strike you, or you keep your goat for I won't pay another cent. It costs too much to keep a big goat like that; they eat up everything on the place." "I'll tell you what I'll do, Mike. I'll let you have him for three dollars cash and your hunting knife with a package of cigarettes thrown in." "All right, it's a go!" said Mike. So Mike took hold of Billy's rope and led him into his yard and thus Billy changed hands once more and became the property of Mike O'Hara. HILARIOUS! If you have goats or love goats or even if you despise goats, you must read this book. My daughter (9 yo) reads parts of it over and over and can never keep a straight face. What an accurate portrayal of goat mischief! I had a few of these books as a child (I think my father had had them as a boy in the 20's) and thought that they were hilarious. My son (8) thinks they're a hoot, too.